There are moments of connection between analysts and patients during any therapeutic encounter upon which the therapy can turn. Moments of Meeting in Psychoanalysis explores how analysts and therapists can experience these moments of meeting, shows how this interaction can become an enlivening and creative process, and seeks to recognise how it can change both the analyst and patient in profound and fundamental ways. The theory and practice of contemporary psychoanalysis and psychoanalytic psychotherapy has reached an exciting new moment of generous and generative interaction. As psychoanalysts become more intersubjective and relational in their work, it becomes increasingly critical that they develop approaches that have the capacity to harness and understand powerful moments of meeting, capable of propelling change through the therapeutic relationship. Often these are surprising human moments in which both client and clinician are moved and transformed. Moments of Meeting in Psychoanalysis offers a window into the ways in which some of today’s practitioners think about, encourage, and work with these moments of meeting in their practices. Each chapter of the book offers theoretical material, case examples, and a discussion of various therapists’ reflections on and experiences with these moments of meeting. 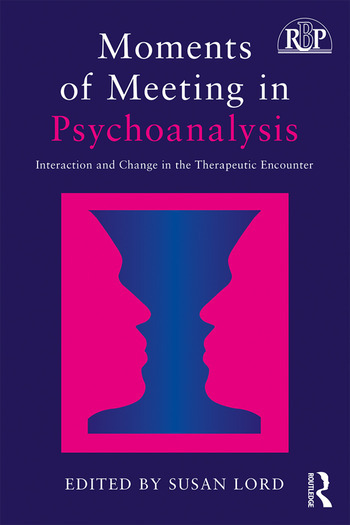 With contributions from relational psychoanalysts, psychotherapists and Jungian analysts, and covering essential topics such as shame, impasse, mindfulness, and group work, this book offers new theoretical thinking and practical clinical guidance on how best to work with moments of meeting in any relationally oriented therapeutic practice. Moments of Meeting in Psychoanalysis will be of great interest to psychoanalysts, psychoanalytic psychotherapists,　psychologists, social workers, workers in other mental health fields, graduate students, and anyone interested in change processes. Professor, UNH Social Work Dept. Susan Lord, LICSW, PhD, is a clinical associate professor in the social work department at the University of New Hampshire, Durham, NH. adjunct clinical faculty at Smith College School for Social Work, and past instructor in psychiatry at Harvard Medical School. She is the author of the book Wealth and Social Responsibility and of several book chapters and articles on work with complex childhood trauma and the use of mindfulness practices in psychotherapy. She is an associate editor of the Journal of Family Therapy, a Taos Institute Associate, and is in private practice in York, Maine. "Moments of Meeting in Psychoanalysis is a stunningly rich collection of relational essays that challenge what cures: by naming the core of change as located in the therapist's subjectivity, the therapist's necessary authenticity, the capacity for bearing the unbearable, all of which result in healing. In a coherent and well chosen volume, Moments of Meeting beautifully illustrates how clinicians can bear affects of shame, suffering, pain, even dying and includes other modalities such as mindfulness, internal family systems and brief treatment. Infant research, Jungian theories, and contemporary psychodynamic relational theorists are well represented in a well edited, thoughtful collection of essays that are historically organized and clinically alive. This is a book for beginners and advanced practitioners which adds to our knowledge of the most contemporary intersubjective theories and practice."-Dr. Joan Berzoff, Ed.D., Professor Emerita, Smith College School for Social Work. This book addresses through a panoply of finely tuned chapters the "hottest" topic in psychoanalysis today—what creates transformative moments in the psychoanalytic encounter. These authors, ranging from Jungian, relational and self psychological, offer theory that is especially punctuated with numerous clinical examples of "moments of meeting" in which patient and analyst profoundly, movingly connect on human themes and existential issues that become the fulcrum for change between and within both participants. The telling and close study of these illustrations contributes further to our understanding and delineation of these transformative moments. This volume is illuminating reading for psychoanalytic-oriented practitioners that will be greatly appreciated from the beginner to the seasoned professional. "-James L. Fosshage, Ph.D., Founding President of the International Association for Psychoanalytic Self Psychology; Co-founder, Board Director, Faculty and Supervisor, National Institute for the Psychotherapies (NYC); Founding Faculty of the Institute for the Psychoanalytic Study of Subjectivity (NYC); and Clinical Professor of Psychology at the NYU Postdoctoral Program in Psychotherapy and Psychoanalysis. "This collection is a hopeful reminder that "arguing polarities is no longer useful." The rich offerings gathered together by Susan Lord in this volume speak to the integration of a multiplicity of theories, models, concepts, and traditions of psychotherapy for purposes of calling attention to how being in relation is humanizing. The contributors speak of vulnerabilities, risk, and the "very human" moments in therapy for both themselves and their clients. And it is precisely this focus that opens the door for transformation, leaving the image of the pathologized individual behind. We have been waiting a long time for this collection! "-Sheila McNamee, Professor of Communication, University of New Hampshire; founding member, Vice President, and board member of the Taos Institute. "This book offers a feast of reflections on moments of meeting that emerge within the space of psychotherapy. Contributions range across the relational analytic psychotherapies, setting out beautifully rich descriptions of practice and layering different though connected theory understandings of what happens (often unpredictably) in significant moments in the space between patient and analyst. I read the various chapters as a systemic family therapist with an interest in psychoanalytic understandings. The practice moments and theory reflections sparked so many resonances, despite (and to some extent, because of) the differences between an analytic and systemic frame, and the very different relational spaces of individual versus family therapy. How wonderful to be reminded of the shared territory of the different psychotherapies - of the lived experience of therapeutic processes, of the capacities and limits of what can happen within the therapeutic relationship in the space-between, and of the transformative potential of the intersubjective meeting of therapist and clients. "-Carmel Flaskas, M.A., Associate Professor, School of Social Work, University of New South Wales, Sydney, Australia, co-editor with Barry Mason and Amaryll Perlesz, The Space Between. "Psychoanalysts have long had a visceral appreciation for those moments of heightened emotional connection with patients. Ineffable yet poignant, unbidden and surprising, infused with unconscious communication, these moments can pass without comment yet have their transformative effects. ‘Moments of meeting’ has become a catch-phrase, but what exactly are they? The broad range of perspectives in this wonderful collection (Relational, Self-Psychological, Jungian, AEDP, IFS and Infant Research - written by leaders in each area) attests to the heuristic value of this phrase as it bears on grief, aesthetics, transcendence, microprocessing, the ‘us’ in intersubjectivity, spirituality, introjection and even emotional absence. This volume succeeds in bringing alive experiences we struggle to name and understand by defining the contours of these elusive, powerful experiences. You will find yourself having more of them after reading this book and your practice will be better for it. "-Andrea Celenza, Ph.D., Training and Supervising Analyst, Boston Psychoanalytic Society and Institute, Faculty, Massachusetts Institute for Psychoanalysis; Assistant Clinical Professor, Harvard Medical School.